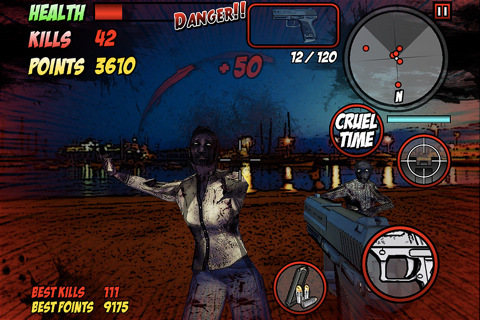 Created by Ringo Games and for absolutely free, Dead Raid is a 3D first person shooter where you have to defend yourself against a zombie swarm from a single position. Enemies can attack you from any direction so you have to turn around constantly and make those headshots count. Dead Raid is a universal app that attempts something pretty new in the iPhone app world. This review is based on the iPhone 3GS version, which means I will not be using the Gyroscope controls. Gameplay is a two-thumb system where you have giant buttons to press on the right and you move the camera with your left. Slide your finger to turn your view and adjust to aim for the head. You have the trigger button; reload button, aim button to aim down your weapon’s sights, and a Cruel Time button. Cruel Time is the bullet time feature that so many First Person Shooters use in the last generation of games. Go into Matrix mode for a limited (but automatically refillable) time to get head shots, save yourself, and rack up kills. I should note though, that turning your camera view can get stuck very often however. With how fast the zombies attack you and how often you have to look at your radar, having the ability to quickly turn 180 degrees is essential, but missing in this installment of Dead Raid. The cell shading is probably the most notable aspect of Dead Raid. The zombies have a rough painted appearance, the text font and the user interface really has that comic-book stylization, and the blood explosions are dark and gritty. It looks really pretty impressive and it does add character to Dead Raid. It’s notable that the backgrounds look lazy however. Take a panoramic image all around yourself and run it through Photoshop. Yes, it does give you a comic book ink style background with lots of details and colors, but it really doesn’t look good by itself. In gameplay however, the settings do work well to set the mood. Another thing that sticks out is the Weapons Shop, which has bright white backgrounds that has text and pictures of guns. It is simple, yes, but it could really use some color, maybe some gradients or some light transparencies or something to not have the menu look so stark. With some technical issues, Dead Raid can’t be considered perfect, but the basic structure and design is fun. Fun to keep your attention but since I didn’t have the Gyroscope, I feel this entry is severely weakened. Just add that quick-turn button please or restrict the gameplay to a 180 play field. Just have the player up against a brick wall or a fence. 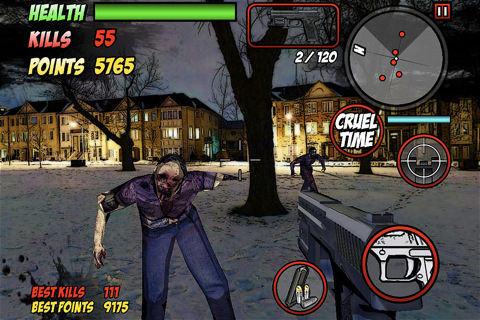 AppSafari review of Dead Raid Free was written by Joseph Ho on July 12th, 2011 and categorized under Action, App Store, First Person Shooter, Games, iPad apps, Universal. Page viewed 4381 times, 1 so far today. Need help on using these apps? Please read the Help Page.